What Gets Trapped in the Gutters? First off, it’s important to note that a lot of different things get trapped in your gutters. Clogs are not usually made up of one exclusive material, and will generally contain a mishmash of random things. A majority of materials you’ll find in the gutter will be organic materials, such as leaves, twigs, seeds, and dirt. This stuff can come from anywhere outside, no matter what area you live in. Other stuff that frequently shows up in your gutters includes shingle gravel from roof tiles, toys (if there are kids around), or nails and other assorted materials from your rooftop. This stuff can come from anywhere, and your gutters are bound to get clogs even if you live in the middle of the desert! How Do Gutter Clogs Form? Even though things get into your gutters, how do they actually form into clogs that won’t just wash out? It seems like materials that land in the gutters should just be pushed out of the downspouts when it rains, since water flows through the gutters. Unfortunately, that’s not always how it works. If it were only one type of materials, such as leaves, maybe there would be fewer clogs. However, clogged gutters can start because one or two pieces get stuck in the silt on the bottom, on a seam, or on any slightly rough area in the gutters. The silt is especially problematic, because it can catch almost anything and make it stick. Once one piece sticks, a lot more debris will get caught on it and will quickly build up a clog. 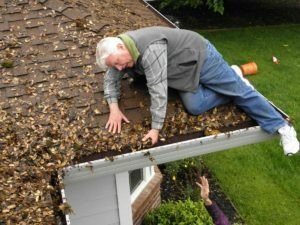 There are a few simple things you can do to help reduce clogged gutters, but you cannot prevent them entirely. The first is to add gutter guards. These are not always effectively, since they can’t filter out everything, but they do help in reducing major clogs from leaves and other types of materials. Arguably the best solution for clogs is to do more frequent gutter cleaning. But removing the layer of silt from the bottom of gutters and frequently scooping out anything that may be stuck, you are going to dramatically decrease the chance of large clogs happening. Previous: Previous post: What Happens if You Don’t Clean Your Dirty Gutters? Next: Next post: How to Do Gutter Cleaning Right on Tall Houses?